The artistry of this design pops with exhilarating jewel toned color, showcased on a heart shaped pave' set minaudiere, adorned with sparkling pink sapphire crystals which illuminate in the smallest glimmer of light. 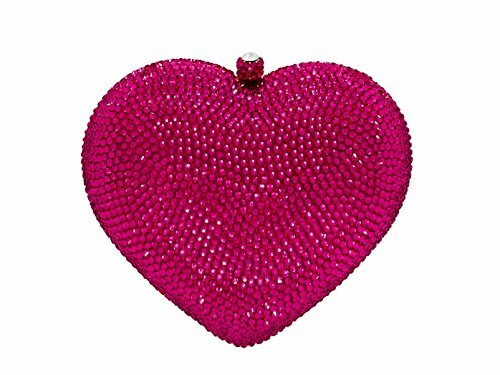 This pink sapphire minaudiere is showcased on heart shaped silhouette with sparkling crystal facets on a hard case frame. This exquisite design pops with exhilarating jewel toned color, in a pave' setting designed to illuminate in the smallest glimmer of light, each hand applied brilliant stone constructed within this piece. This romantic pave' makes an exquisite statement piece for the Bride to Be, and perfect gift for a Bachelorette Party, Bridal Shower, Wedding Shower, and more! Accessorize your Wedding Party, Brides Maids to be, Flower Girls, and even the Mother of the Bride and Mother of the Groom, with a stunning gift of appreciation and wonderful keepsake of your special day. Ask! Pop the Question! Will you be my Bride? Will you be my Bridesmaid? ; Will you be my Maid of Honor - Matron of Honor? ; Will you be my flower girl?, Will you be my Valentine? No matter the occasion, this elegant clutch will be immensely adored! If you have any questions about this product by Celebrating You Shop, contact us by completing and submitting the form below. If you are looking for a specif part number, please include it with your message.